So, I am not quite meeting my goal yet, of blogging once a week. But hey! I'm posting more often than last year, and I'm actually starting to remember to take pictures of the things I make, which is a big improvement. I'm all about progress...not perfection. My official Quilt Market roomie (*squealing with excitement*) Bari J. asked me to test another pattern for her. 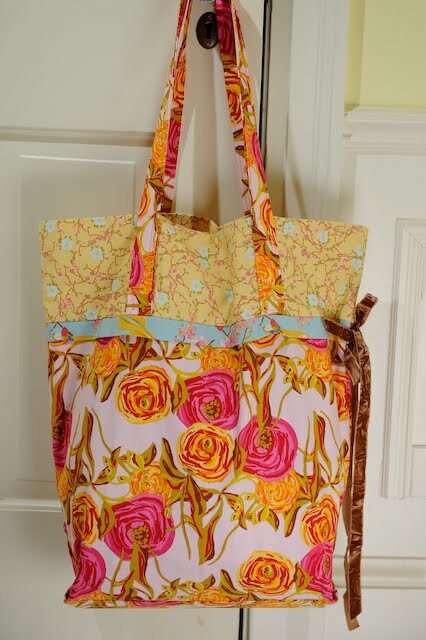 And FAR be it from me to say no to some fat quarters of yummy fabric and an early sneak peak of a pattern! 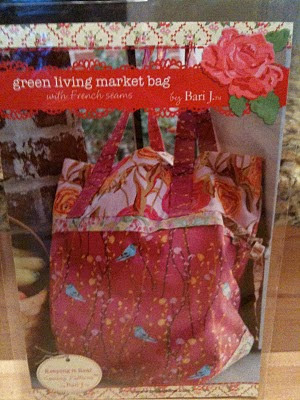 I tested her Green Living Market Bag pattern that was one of the four in her first grouping of designer patterns. 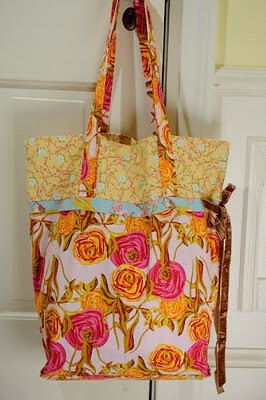 This is how the finished pattern looks...and as a side note, this is my favorite style. The pattern is like a booklet (with pretty glossy paper) and the pattern itself is on sturdy white paper folded inside. It's also in a zip top bag. I'm sure this costs more money, but GOD does it make for longer lasting patterns, and easier storage. The rest of the photos were taken by Rob, my photog extraordinaire. He actually puts the majority of his stuff right on Facebook...but I figured this was a shameless enough plug. 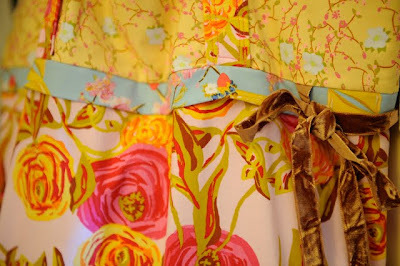 The pattern went to together really easily, and I love the ribbon to tie it together. 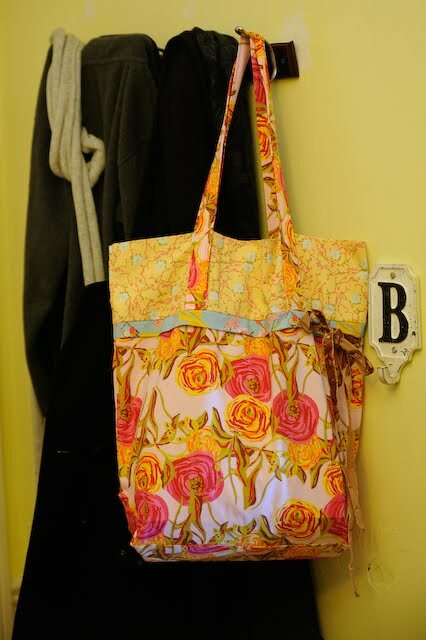 It actually folds down into a tiny square so that you can either put it in your purse, or you can put a bunch of bags together to go to the store and not carry what looks like a tent. My biggest challenge with the pattern was folding the pointed ends of the flat bottom up on either side. The only challenge was that the fabric was many many layers thick. So I actually used a denim needle, and sewed really slowly. It gave the bag a very polished looking exterior, instead of just the normal flat bottom. I'm pretty sure my mom is getting this for Mother's Day, so mom, if you read this...sorry to ruin the surprise! It's a great bag to carry books, groceries, or better yet, I actually carry mine in my purse, so that when I stop in somewhere like the pharmacy, or even somewhere at the mall (*gasp*) I don't have to take a plastic bag. Think green, and look super fashionable. Gotta love that.